What-the-hell-is-that spectacle and a dozen hypnotic repetitions of "PuppyMonkeyBaby" keep you staring at the screen like Alex in "A Clockwork Orange" when his eyes are wired open. Unlike Alex, you like it. The ad's scenario doesn't go terribly far, but considering where it starts, that might be a relief. The premise, once revealed, finally snaps your attention from the incomprehensible creature to the suddenly comprehensible Mtn Dew Kickstart. It's weird in the best Super Bowl-ian way. The Super Bowl 50 ads for Buick, Mini and Toyota all carry whiffs of defensiveness: A guy is surprised that a cool car is a Buick, tall Randy Johnson really can fit in a Mini, and cops chasing a Prius discover that it's "actually pretty fast." But Toyota's take disarmingly counters negative suspicions instead of reinforcing them. "The Longest Chase" proceeds to play up product attribute after product attribute without one hard sell. Great writing and acting make this one of the most absorbing and entertaining ads of the game. The sophomore Super Bowl appearance for Avocados From Mexico shifts the action from pre-history to the far future, when Earth rates a midsize hall in an alien Museum of Natural History. It yields one of the funniest commercials in Super Bowl 50, with better-than-average use of the Super Bowl-staple celebrity cameo. As a happy bonus, the pitch--Mexico's avocados are always in season--successfully reminds viewers to make guacamole more often. Budweiser made a bold move in last year's Super Bowl by taking on the microbrews nipping at its Clydesdales' hooves. Plenty of beer drinkers would argue that Bud didn't have much to go on, product-wise, and punching down almost never looks good, but the 2015 ad somehow pulled it off. "Let them drink their pumpkin peach ale," the voice-over said. (Small brewers subsequently trolled Bud by rolling out actual pumpkin peach beers in response.) This year Bud brought back the theme with another impressive execution, including glimpses of Clydesdales that convey the animals' power better than any of the recent stuff with puppies. (It's the first time they look like impressive beasts instead of versions of Santa's reindeer.) "Not Backing Down" dismisses smaller brewers as hobbyists and even proclaims that Bud is "not for everyone," as if it's mostly for sophisticated palates. It's playfully rude, and macho without bullying. Hyundai wants you to know about a compelling product attribute: "auto-emergency braking with pedestrian detection." But it wants you to care, too. So "Ryanville" sends two women to a town where everyone is Ryan Reynolds. Good thing they're driving a car "that doesn't get distracted." Where Avocados From Mexico uses Scott Baio perfectly judiciously, Hyundai uses Reynolds perfectly extravagantly. NoMore.org, the group formed in 2013 to battle domestic violence and sexual assault, gets a second consecutive go in the Super Bowl, even though the league isn't feeling the same kind of pressure that the Ray Rice scandal engendered during the 2014 season. The new spot, again by Grey New York, is also chilling in a surprising way. Asked via text whether she's OK, a woman struggles to answer, as seen by the dots that appear on an iPhone when you start typing a reply--and disappear when you delete what you were about to say. "Data suggests nine months after a Super Bowl victory, winning cities see a rise in births," the NFL informs us at the beginning of its coast-to-coast, Seal-tastic paean to "Super Bowl babies," which spans three 10-second spots and a 60-second main event. (Ad Age reporter E.J. Schultz asked to see that data, by the way, without luck.) "It is a day," Super Bowl babies sing, "so super it's why we were born." You'd think this was overreach. Instead it's stirring. The "Football Is Family" messaging is a step too far but easy to overlook. "Here's what we were thinking," the voice-over starts as the score kicks in. It's not Anthony Michael Hall's introduction to "The Breakfast Club" ("Dear Mr. Vernon: We accept the fact that we had to sacrifice a whole Saturday in detention for whatever it was we did wrong...."), but it's intriguing to a surprisingly similar degree. If Quicken and Fallon's line of thought turns out to resemble a self-interested, not-exactly-rock-solid National Association of Realtors pitch--homeownership lifts the entire American economy!--their vision is painted so winningly that viewers won't mind. Let's hear it for wooden leg-makers, and for "PUSH BUTTON GET MORTGAGE" fantasies. Helen Mirren won an Academy Award for her title role in "The Queen," but she deserves a prize, too, for the King of Beers' first anti-drunk driving Super Bowl ad since 2006. She turns a minute-long lecture into a pleasure, probably even for people who'd been planning to "drive carefully" on their way home from watching the game. While Jeep Super Bowl marketing has occasionally veered into ponderous terrain, this spot is on-target, big-day marketing, an accelerating montage of more than 60 images from history. The 75-year-old brand pulls off a birthday party for itself without seeming indulgent. Humor helps: Amid serious moments, a "Jurassic Park" dinosaur turns up. A new razor and an old model turn into robots when their owner isn't looking and fight to the death. The pitch--"a hydrating gel reservoir that gives you 40% less friction"--is as hard to accept literally as any other razor come-on, but it suggests something good. Unfortunately, a commercial that flies in other contexts doesn't always match up on Super Bowl Sunday. Charismatic Pepsi endorser Janelle Monae dances through eras of American music in Pepsi's halftime lead-in. The bit is reminiscent of the brand's ad starring Britney Spears in a variety of decade-specific set pieces, just with less energy and scope. By the end it seems like Monae is killing time until Coldplay. Liam Neeson, star of the entertaining "Clash of Clans" commercial in last year's game, returns to Super Bowl duty in an ad for LG OLED TVs that sees him playing his older self, dropping nonsensical knowledge on a younger self played by son Michael Neeson. The "Tron"-scape is all right, if tough to make out without all the neon piping to light the way, but the product itself doesn't get much time. TurboTax hammers its name into every opening under cover of mocking overbearing product placement. It's a familiar tactic that risks becoming its own target. "The Colbert Report" made it work with bits like "Hail to the Cheese: Stephen Colbert's Nacho Cheese Doritos 2008 Presidential Campaign." A 2011 Bud Light Super Bowl ad pictured a movie cast and crew who realize they get free stuff if they work it into their scenes. Here Anthony Hopkins tells an interviewer he would never sell out, then lifts his TurboTax.com teacup. That's just the start, but the payoff never arrives. 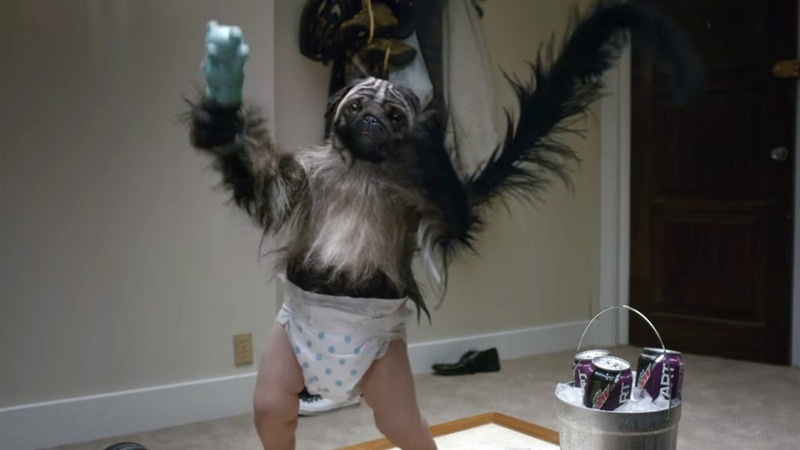 Not every Super Bowl ad needs a PuppyMonkeyBaby. What about 15 seconds of comparativeadvertising, bragging about how a little-known brand topped every big player in the category on a performance test? These 15 seconds will admittedly likely move some upstart product. But actor Peter Hermann doesn't get much to do in his role as the "debonair, tuxedo-wearing, stain-fighting superhero, The Professional," as Persil ProClean describes his character, and #gamedaystains is something shy of a surefire trending topic. Despite the celebrity turn, it feels more like a commercial to run during an after-school special than in the Super Bowl, and not just because it's a candy ad. The weird mansion setting evokes a "Scooby-Doo" episode, and Steven Tyler may be better suited for an amusing cameo than top billing. Skittles and DDB's "Settle It" from the 2015 Super Bowl told an equally weird story more fully, and squeezed in more enthusiasm for the product. Having decided that it needs to nearly apologize for its brand--a shocked wedding guest asks "That convertible's a Buick?" about a car he likes--Buick does its best. Model Emily Ratajkowski makes a spectacular catch of the bride's bouquet, leading onlookers to take turns saying she "O'Delled it," a reference to New York Giants wide receiver Odell Beckham Jr. (also in attendance). There's a halfhearted gesture toward humor when even the older lady chimes in, "totally O'Delled it." Surprise, a senior citizen understands what's going on! Doritos' final "Crash the Super Bowl" user-generated ad contest didn't yield its best results. A cute ending salvages the slow start for "Doritos Dogs," but the totem-pole trench coat routine is so worn (BuzzFeed last year ran a listicle headlined, "53 Signs Your Boyfriend Is Really Three Children in a Trenchcoat") that it's going to get a groan at best from many viewers. "Hold your breath," SunTrust tells viewers having fun on Super Bowl Sunday. "Hold it. Hold it. What you're feeling now is just like financial stress." Thanks, SunTrust! What's worse is that an ad ostensibly aimed at encouraging consumers to stop sweating their finances never quits with the ominous ticking-clock sounds. "So now, let go, and breathe," the voice-over finally says, in precisely the same intimidating tone as before. "Feel that relief?" Do you? Why is that clock still ticking like that? Could we get some pop music to help turn the corner? Viewers who want to join this movement will have to visit OnUp.com to actually find out anything about it.